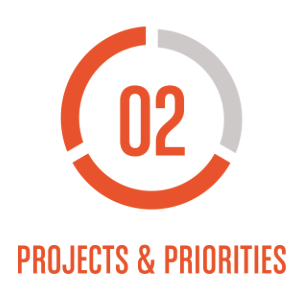 This second level in the Mastering Workflow Series dives deeper into the GTD® models for defining and planning projects and managing priorities. You will learn key elements for defining and managing a complete inventory of multi-step outcomes within an integrated system, providing control and appropriate focus, week to week. The key result on this level is clarity. There are two components to build your success at each level in the series–the course and the follow-up workshops. The Projects & Priorities course is presented over one day or two half-days and includes engaging lectures, clever animated videos sharing the best practices, hands-on exercises, group discussions, and Trainer demonstrations. This level brings a new and more complete degree of “Mind Like Water®”—with the facility to recognize tensions as they emerge and transform them into controllable outcomes and doable actions. Problems, issues, and opportunities are translated into real projects with executable next actions. The follow-up sessions, called the Installation & Implementation Series, support you after the course in building and maintaining trusted systems and making the most of your investment in learning the Getting Things Done® methodology. They range in length from 60 minutes to 2 1/2 hours. This course is open to those who have completed a Level 1: Fundamentals course, attended a previous GTD Mastering Workflow course, had individual GTD coaching, or read the Getting Things Done book and are confident they’ve got a solid system in place and are practicing the Five Steps. Please reach out to us if you have any questions about where you are in your GTD practice.